Another pal has made the trip Over the Rainbow Bridge. Sterling the greyhound lost his battle with cancer yesterday. Sterling belongs to my good kitty friend from Twitter, Blueberry. Sterling fought a brave battle for three years, undergoing chemo and amputation. It didn't slow him down though! He was a happy dog, smiling and running, just like nothing had ever happened. Don't believe me? Here's proof in a video he posted to YouTube. His family threw a big party for him to celebrate his being cancer free that Mom actually got to attend virtually because they live-streamed it. They even had a camera set up so that his human could look in on the dogs from work. Sometimes Mom would look at them too! Unfortunately, all three dogs in that fun video above-Sterling and his fursibs Rynn and Lyra-are now at the Rainbow Bridge due to cancer. Mom always felt something special for Sterling, not just because she loves his human and Blueberry so much, but because she lost her big dog Oscar to the same kind of cancer. Sterling gave her hope that doggies really could beat cancer even though she lost her dog-love to it. Even after Sterling's cancer came back last month, Mom was hopeful he would beat it again. I guess it wasn't meant to be. Mom and I are sending much love to Blueberry and his family during this sad time. I'll miss hearing about Sterling and seeing the pictures Blueberry would post. I'll always remember him as a good, good dog. If you hate cancer as much as Mom does, you might be interested in this webchat she will be attending next week. OncoLink.org is hosting the webchat next Tuesday, August 7th, 2012 from 12:30 to 1:30 PM Eastern. The chat, When A Beloved Pet Has Cancer, will be held from the Oncology Department at the University of Pennsylvania School of Veterinary Medicine and will focus on cancer in pets. Usually I dedicate my Thursday posts to promoting a homeless pet, but this week is different. This week my Thursday post is all about gratitude. Things were very hard for Mom & Dad when I made my journey to the Rainbow Bridge. Their grief was overwhelming for a while. It turns out, Mom & Dad weren't the only ones who thought I was special. First, some of the other volunteers paid for my cremation at Wayside Waifs. Mom & Dad had to give up their anniversary trip & open an account with Care Credit to pay for my V-E-T bills, so this was very helpful. It was one less thing for them to worry about and eased the financial burden. Then, Mom got a phone call from Barb at Wayside. She was calling to let her know that another pawsome volunteer, Michelle Cour, had donated something special to the shelter in my name. It was a cat exercise wheel! How cool is that?! Not only was it donated in my name, but they added a plaque to let everyone know. Mom loves the idea that my name will live on at Wayside Waifs where we first met. Not to mention how many kitties will get to run on the wheel! Mom also got a letter in mail letting her know that an anonymous donor made a contribution to Wayside Waifs in Sebastian's name. She has no idea who did it, but it made her smile. I've gotten so many nice tweets, Facebook messages, and cards that let me know people really loved me, even when they didn't know me in person. Mom always felt a special bond with me and left me with a special message whispered in my ear during my last moments on Earth to let me know she felt it. All of the lovely messages and acts of kindness reaffirms for Mom what she believed: there was something special about me, something that couldn't quite be explained. Maybe I was an old soul, maybe I could feel others' emotions or maybe I could express love better with my eyes than some can with words. All I know for sure is that other people get it and that makes Mom extremely happy. And I'm thankful for every happy moment Mom has. Whaddya Mean You Don't Like Salmon?? Pals, I haven't wanted to say anything cuz I'm giving little Harvey time to settle in and I don't want to hurt Mom's feelings or anything, but that cat is WEIRD. Nothing. Not crunchy treats, not soft ones, not even my all time fave, dried salmon. There is something seriously wrong with that feline. Mom has offered him several different treats, but all he wants is his kibble. She will put a few treats by his bowl and they will sit there for days. He might eat one, he might not. Mom has to throw them away if he ignores them long enough. Do you see that? That's a piece of salmon in his dish. He doesn't even want to eat people food. Just kibble. And boy does he scarf that stuff down! I hope Mom doesn't think it's her fault, he's clearly defective. I guess not all kitties can be as smart as me though. He's completely ignoring the salmon. I would have gobbled it up and begged for more! I gotta run. I hear there's some salmon in tonight's OTRB buffet. Here we go again. Mom has a new shelter love. 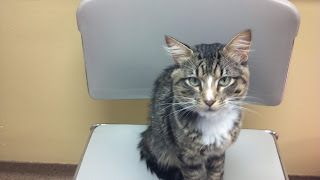 His name is George and he's a one-year-old brown tabby. He is also FIV positive, so he's special needs and harder to find a forever home for. 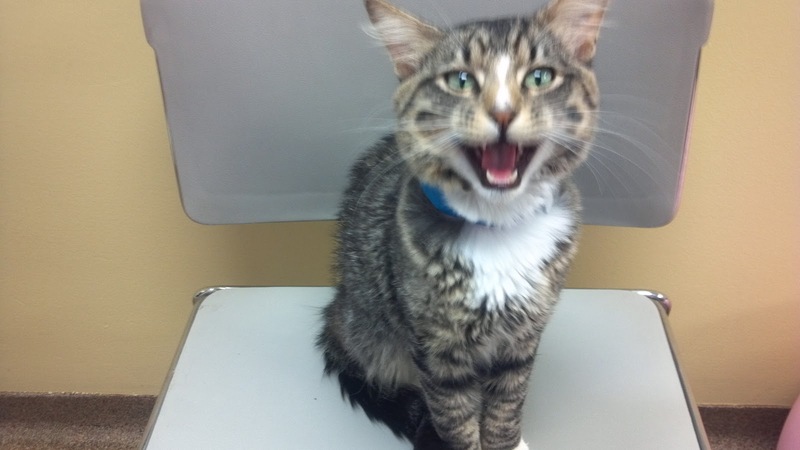 For a refresher on FIV, click over to a great article by Best Friends Animal Society. Mom fell in love with George when she saw the white stripe down his nose. He's kind of skinny and looks like he's had a rough go of it, but that doesn't make him any less handsome in Mom's eyes. George is very sweet and didn't hesitate to get in Mom's lap for a long cuddle session. It was just what she needed since my new Earth brofur, Harvey, isn't a cuddly kitty. She sat with him on her lap for the longest time, both of them content to just sit there. George is also a talkative kitty and said "Hello" as soon as she walked in his room. George would make a great pal to have around the house. 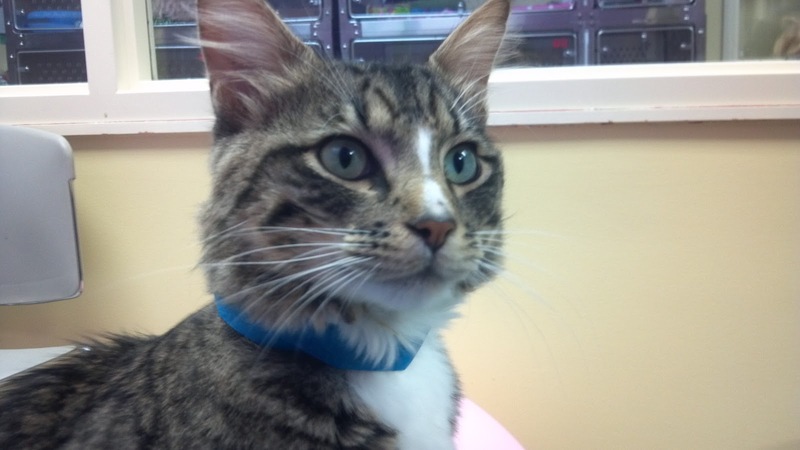 He'll follow you around, keep you company, and be a top-notch lap cat! 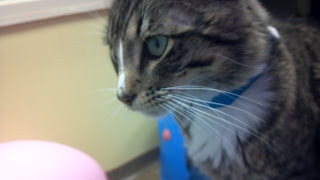 He'll need to be the only cat in the home or go to a home with other FIV positive cats. He'll also need to be kept strictly indoors and his health must be a priority. If you think you're the right match for George, go spend some time with him at Wayside Waifs in Kansas City and see for yourself how wonderful he is! Wordless Wednesday: How Long Do I Have To Put Up With This? Mama was going to post this the Wednesday before I went OTRB, but since I was in the hospital she decided to wait, thinking I would be home soon and she could post it then. The picture was taken the day before I got sick. I was healthy and feeling good, hanging on the deck with Mom and Dad. Mom's niece came to visit and brought her two kids. This is Kent petting me. I wasn't thrilled about it, but I laid there and let him touch me. All the time I was looking at Mom, letting her know I was NOT happy! You've probably seen the posts I've done recently about cool information that Mom got at BlogPaws from Trone Brand Energy. At this point you're probably wondering, "Who is this Trone company?" Well, I'll fill you in! Trone Brand Energy is one of the largest independent brand communication agencies in the Southeast. They are located in High Point, North Carolina. Trone Brand Energy is a full service marketing firm providing many services including: social media, advertising, design, public relations, and event marketing. They work a great deal with pet-related companies. You are probably familiar many of the companies they worth with. My favorite is GREENIES (but whose isn't?). They also work with PetArmor, Pedigree, Royal Canin, and Nutro, among others. You can get to know more about Trone Brand Energy by checking out their website at www.tronebrandenergy.com or connecting with them on their Facebook and Twitter pages. You can also see what Trone Brand Energy is doing to work with pet bloggers by checking out Petvocate.com. Trone Brand Energy is a great company to get to know. I hope you take the time to connect with them! Mom was compensated by Trone to help them spread the word about the information they gathered. Honestly, this was super-good info and Mom is happy to share it for free! MEET THE HELEN KELLER OF CATS! Gretchen may be special needs, but she is absolutely not challenged! She is a one-year-old oriental shorthair mix available for adoption at Wayside Waifs in Kansas City. If you watch her walk, you'll notice that her head kind of wobbles a little bit. After many tests, the vets figured out that she has limited vision and hearing, they figure that is why her head wobbles like it does. Gretchen doesn't let that stop her though! Most days you will find her free roaming around the cat adoption area. She loves to explore and socialize. She is quite brave! She can also be very vocal and loves attention. Because of Gretchen's special needs, she would do best as the only pet in the home. She would do okay with kids, but they would have to be mature enough to understand her situation. If you are in the market for a special needs kitty, Gretchen would be a perfect addition to your family! What Is Important To Pet Blog Readers? More Trone Brand Energy Info! Okay, last week we talked about who pet blog readers are. Now we need to figure out what is important to them, what they are looking for. At BlogPaws in Salt Lake City last month, Trone Brand Energy's Amanda LeGaux gave a short presentation about a poll they conducted and came up with some great information to help pet bloggers give their readers what they really want. Something that is really important to pet blog readers is DESIGN. The layout/design of a blog strongly impacts a reader's willingness to stay and read the content. If it doesn't look good and isn't easy to navigate, a reader will be gone in mere seconds. Those are all great topics, but guess what pet bloggers are focusing on? Amanda pointed out that we, as pet bloggers, aren't completely missing the mark. Instead, when we want to write about PREVENTATIVE CARE, we could write specifically about VETERINARY CARE, HIP AND JOINT HEALTH, or ELDERLY PET CARE. If we want to write about FOOD INGREDIENTS, we could focus on DANGEROUS FOODS or HEALTHY TREATING. I think this is great to know! I love that my anipals and fellow bloggers read my posts, but I would like to share information with the people who are looking for it too! Of course, this doesn't mean that I will (or you should) change my blog focus, but it's important to write an occasional post about a topic readers are looking for. If I can draw in more readers by doing so, maybe they'll stick around and read the other posts I write too! Wondering about who Trone Brand Energy is? I'll share that with you in an upcoming post too! Many of you are familiar with Baby Patches and her store NipandBones.com. Mom and Dad bought me the cat tree I love so much from there and then, when I lost it in a fire, BP let them order another one even though it wasn't available on the website anymore. This is my favorite way to help. You're giving your business directly to the shop AND you're getting cool stuff at the same time. Mom just bought a cleaning kit and filters for Harvey's water fountain from there. Guess what? Both items were cheaper than at the local pet store. You can give at Baby Patches' GoFundMe page here. Cash is always helpful! Our pal Cathy Keisha is auctioning items with the proceeds going directly to Baby Patches. Check out her blog to see what you can get your paws on! Maybe you have a pal that doesn't know about Nip and Bones. Maybe someone doesn't know they're struggling. Tweet, blog, Facebook, whatever. Just tell people. Attend the online pawty this Saturday, July 7th. Prizes will be given and fun will be had all in the name of helping our furriend! More info and RSVP here. I know Mom has plans to buy some more stuff for Harvey and she will buy what she can from Baby Patches. I hope she can continue to buy from her for a long, long time! Mom just loves Independence Day. She wanted to get married on July 4th, but had to settle for the 3rd instead (Mom and Dad were married 2 years yesterday!). Bring the pet inside-If they are confined, they will feel more secure and can't run away. Turn on a TV or radio-The sound can help mask the noises from the fireworks, even a fan can help. Use a calming collar or Feliway for a cat-Every little thing can help. Use a V-E-T prescribed anti-anxiety med or a ThunderShirt-Mom always felt bad about medicating her Oscar, but it was better than seeing him scared. Please keep your pets safe and secure today! Who Are Pet Blog Readers? In the couple of years since Mom started my blog, she has often wondered what to help me post about. She would love to just focus on me. After all, I'm quite a handsome kitty with the most adorable belly ever! That might get a little boring though. Also, I want to spread the word about shelter kitties since I used to be one myself. I like to encourage people to adopt, volunteer, donate, and otherwise help their local shelters. This information probably doesn't surprise you too much. In fact, like Mom, you can probably see yourself in many of these stats. But where is this pet owner looking for information? Okay, we know that pet bloggers are important to pet owners. Now what? Now we need to know how to draw pet owners to our blogs with the information they desire. Look for that information in an upcoming post with more handy info from Trone!